From rural farms on the eastern side of the state to quirky high tech Portland, Oregon boasts one of the most favorable environments in the country for home solar power. The people and governing bodies of Oregon respect the natural beauty of the state and are working hard to preserve it for years to come. Oregon has long been a leader in using renewable energy for electrical production. Oregon is the home to many hydro-electric dams and wind power farms. While Oregon home electricity consumers have benefitted from these low cost renewable sources in the past, Oregon homeowners are learning how much more they can save by switching to home solar power. 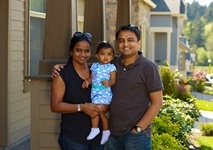 When Anbu Varatharajan and Durga Nallathambi purchased a newly built home in 2012, they chose one with energy-efficient features…However, their home wasn’t equipped with a solar electric system, and the couple wasn’t sure if it would fit their budget. They quickly learned that solar was in reach thanks to Energy Trust incentives and a solar lease plan. “We were able to work with our contractor on a solar lease plan, which meant no out-of-pocket cost for us right now. But we can still make a positive environmental impact and, of course, an impact on our energy bills,” said Anbu. Last year in Oregon over $28 million was invested in solar installations. Oregon ranked #25 in the nation for new solar installations in the United States. As of 2015 there is enough solar energy installed in Oregon to power over 11,000 homes saving electrical power consumers thousands of dollars yearly. The solar industry is also become a major benefactor to the Oregon economy. As of 2015 there are over 148 solar related companies, employing over 2,100 people in Oregon. Solar industry jobs in Oregon include manufacturing, installation, sales, distribution, engineering and financing. Solid Oregon solar policies have helped the success of Oregon home solar programs. Oregon’s renewable portfolio standards are among the best in the United States. Oregon RPS requirements are based on the size of the utility: Large utilities must source 25% of their electricity from renewables by 2025, Medium sized utilities, 10% by 2025, and Small utilities, 5% by 2025. This requires every utility to participate in a renewable energy future for Oregon. Because Oregon allows for net metering the state has attracted the attention of some of the leading solar companies in the nation creating financing opportunities, including solar leases and PPA’s ( Power Purchase Agreements) that make it easy to start saving on your energy bills immediately. Many Oregon homeowners will easily qualify to get a solar power system installed with absolutely no upfront costs. At approximately 9 years, Oregon has one of the shortest home solar payback periods in the nation and savings will continue long after the system is paid off. The life of a solar PV system is 20 years or more.